Lake Natron in Tanzania is so salty that it can calcify creatures that crash into it. Photographer Nick Brandt discovered the flamingo shown above as well as bats, eagles and entire flocks of flinches that had all been turned to stone by the Natron's alkaline waters. 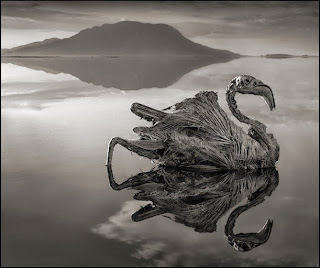 More here, along with other creepy-beautiful photos from this deadly African lake.